It’s that time of year, when bloggers and crazy Jewish women everywhere scramble to come up with unique variations of hamantaschen. And I am nothing if not a crazy Jewish woman. 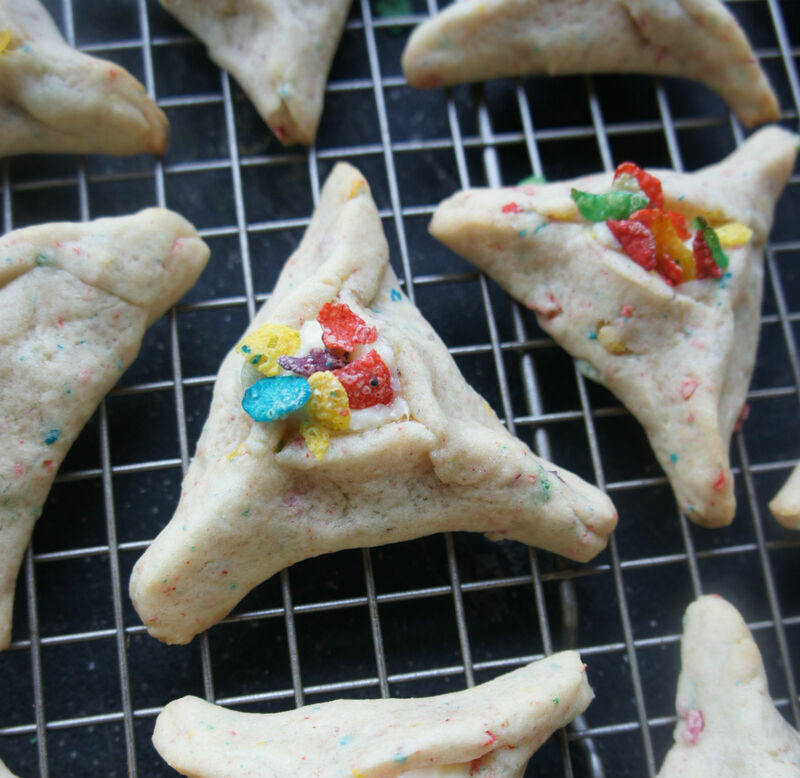 As I mulled over what kind of Purim treats to whip up this year, I wanted to create some vibrant cookies that tasted as delicious as they looked. I don’t know what it is about a bowl of cereal that is somehow comforting and indulgent, but that was my starting point for these milk and cereal hamantaschen: a long way from the story of Haman and Esther, but fun and celebratory nevertheless. Kids will love making and eating these colorful treats using their favorite cereals; try using any cereal they like, as long as it’s a bit sugary (hey, it’s a holiday!). 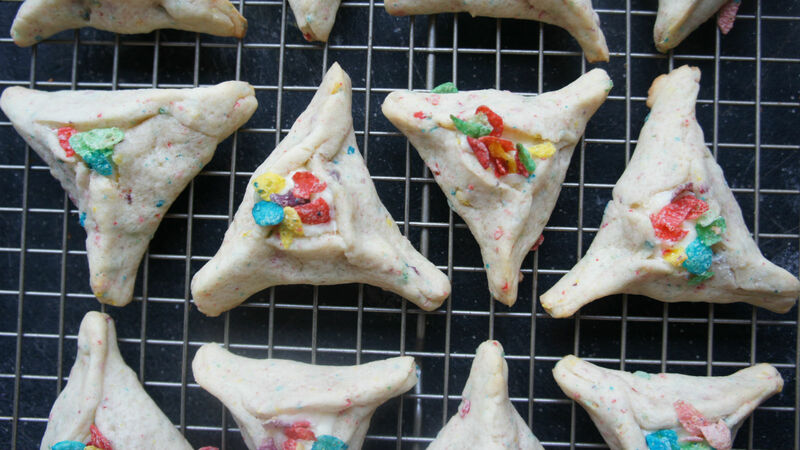 And if you like handing out gifts in your community as part of the festivities, these hamantaschen would inspire an adorable breakfast-themed Mishloach Manot. Start by prepping the filling: In a small bowl combine the milk and Fruity Pebbles. Set aside. To make the dough, cream together the butter and sugar. Add the egg, milk and vanilla extract. In a separate bowl, whisk together the flour, salt baking powder and crushed cereal. Add dry ingredients to wet mixture in batches until dough forms. While dough is chilling, finish making he filling. Combine the milk-cereal mixture with softened cream cheese, sugar, salt and vanilla. Take half dough and roll out to 1/4 inch thickness. Cut rounds using a cookie cutter or drinking glass. Add about 1/2 tsp filling into the middle of each round. Fold corners up into triangles, pinching carefully on each end. Place cookies on a baking sheet lined with parchment paper or a silpat. Place in fridge for 10 minutes. Bake for 9-11 minutes. Allow to cool.